Help prevent split ends and moisturize hair with this coconut oil based hair serum. This hair treatment will moisturize your hair, helping prevent split ends. It will also bring extra shine to your hair. Coconut oil is used as the base for this recipe with a little argan oil and rosemary peppermint fragrance. This invigorating spray will liven up your hair and your attitude! You Save $18.75 by purchasing this kit rather than buying the items separately. "Great for all kinds of hair"
COMMENTS: My customers loved this. The best part is using the Argan Oil and it is more than what most companies put in their products. Next time I will use a glass bottle vs the plastic. I think the glass just looks nicer when you are selling this at a higher price point. COMMENTS: It only takes a little of this serum! I use just one spray in the palm of my hand to distribute onto the ends of my hair after shampooing. No frizzies and no oiliness. I haven't used conditioner since I started this, and I love it! "Can the scent of this serum be changed with changing the formula? If so, which type of essential oil can be used?" Staff Answer You can change the recipe to use any fragrance or essential oil you like. 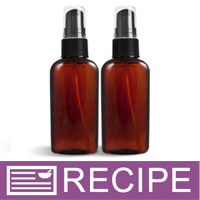 "When making a Hair Serum with infused oils should I use a preserve? " Staff Answer You should not need a preservative. Just be sure to strain it well before adding to your serum. "Is there a way or ingredient I can use to make this serum a little thicker?" Staff Answer Adding a melted butter or an emulsifier should thicken this serum. You will need to test any alterations to our original recipe. You will also need to change the ingredients listing to reflect any changes to our original recipe. "I was wondering the measurement of the bottle in order to be able to purchase labels? " Staff Answer We recommend you purchase the product prior to purchasing labels so you have the product in hand. This ensures that there are no discrepancies with measuring methods. "Is this meant to be washed out or is it a leave-in?" Staff Answer This recipe was meant to be used as a leave-in product. "What is the typical shelf life of this hair serum? " Staff Answer The products are best if used by one year from date of purchase. "Can I use fractionated shea butter instead of the fractionated coconut oil or is it too thick? Thanks!" Staff Answer Liquid Shea Butter is a thicker consistency than Fractionated Coconut oil which remains in a liquid form. You could certainly test Crafters Choice™ Shea Butter - Liquid, Refined in this recipe, but it could result in a thicker product.